Ever notice how some people appear to be organized, on time, and professional all the time at work? Well, it's not because they are gifted or more talented than you. They just happen to know a few organizing tricks that make them appear that way. You too can exude that same expression of calm and control in your workplace by employing these simple strategies. It's almost become a status symbol to brag about being a multitasker. However, recent studies have shown that multitaskers may not have an advantage over others when it comes to completing work accurately and on time. According to Victor Imbimbo, in his blog featured on the Huffington Post, "Is Multitasking Actually A Myth? ", our brains can only work on one task effectively at a time. The illusion that we call multitasking is actually our ability to switch activities quickly. So, instead of taking time to switch back and forth between activities, stick with one until you complete it, and then move on to the next one. Stay on top of long and short term projects and deadlines by breaking down the project into smaller tasks that can be done a little at a time. Then schedule time into your calendar to complete each task. Set a reminder a day or two ahead of each task so that you can adjust your schedule to accommodate these small steps. In this way you will be able to decrease the stress associated with deadlines and complete projects on time. You may be juggling 10 projects at once, but that doesn't mean that you need all the information for every project scattered across your desk all day long. Filling your work area with unnecessary papers unrelated to the task at hand can make you feel tired and overwhelmed. 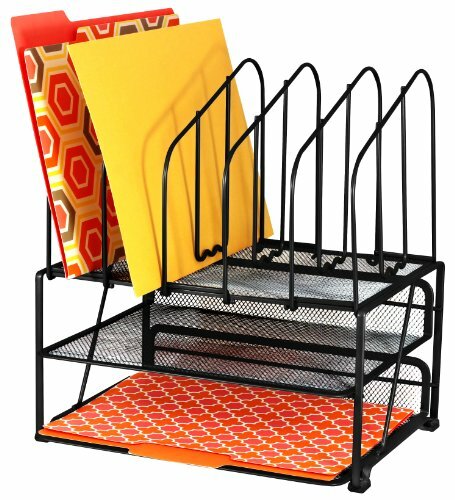 Instead, store your files in a tiered vertical file holder. And, arrange them from most important in front to least important in the back. As you complete a task place the folder behind the other folders in the holder. This will give you a sense of accomplishment and bring order to your work day. Take your organizing to the next level by color-coding the files in your vertical file. Remember that your desk/cubicle or office space is a reflection of your professionalism in the workplace. Don't let others get the wrong impression viewing a space overwhelmed by chachkies and personal memorabilia. Choose wisely what you will and will not display in your work area. Credit: blog.epromos.comLikewise small necessary office supplies such as staplers, paper clips, sticky notes, pens, and the like can also create unnecessary clutter. Consider using a basket or stylish lazy susan to house these supplies, or keep them hidden in an easily accessible drawer. I once worked for a woman that insisted that everyone in the office clear their desk before leaving work each evening. I have to say that I thought it was an extremely unreasonable request until I started getting in the habit of doing it. This one simple suggestion can turn any workplace into a more effective professional environment. Clearing your desk each evening means that you come into a cleared desk each morning. It's a new start. And starting each day with a "clean slate" gives you a fresh perspective on your priorities and your projects. You're also prepared for unexpected visitors, or last minute assignments that take priority over what was yesterday's priority. Even if you have to toss everything into an empty drawer each night to begin the process, do it. You'll be amazed what a difference this one simple action will make in your work day. Being organized at work will decrease workplace stresses, increase your effectiveness and help you build your reputation as a dependable professional. All it takes is a little attention and action on your part. Start by putting these organizing strategies into play today. Recognizing that just one organizational system is not for everyone, the authors have devised solutions that provide ten different systems to match ten basic personality types such as Perfectionist Plus, Hopper, Fence Sitter, Pack Rat, and Total Slob.